I found this pic on my phone the other day and I thought I’d share it. A friend surprised me with these lovely potted herbs as a present for my birthday in Feb. She bought the plants and then repotted them in those cool little tin buckets, she even made sure to make holes in the bottom for drainage – something that I, a complete plant novice wouldn’t have done! Don’t you think it’s such a cool present idea? 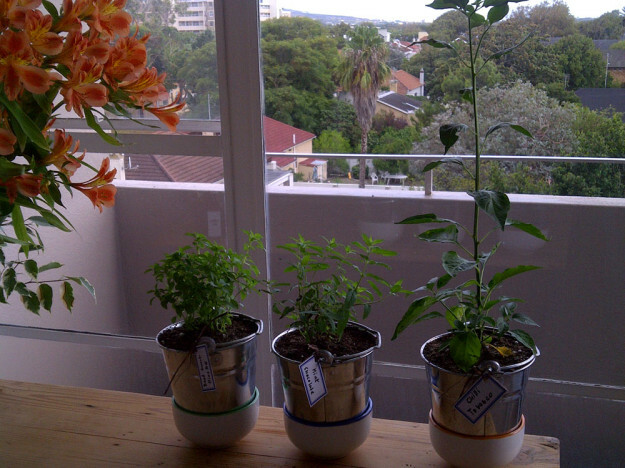 We have from left to right a Sweet Basil, Mint Chocolate and the tall one is Chilli Tabasco. She even made funky little labels to go with them. I used 3 bowls from my kitchen which have different colours on the inside as little drip trays and have the plants on the windowsill in my kitchen. I don’t really have a green thumb (i.e. I have a reminder on my phone to water my plants once a week …) so I’m pretty chuffed I’ve been able to keep two out of the three alive and healthy. Sadly the Chilli Tabasco died a tradgic death, it was a bit tall and I think got sunburnt through the window. But the other two are happy and healthy and smell delicious. I use the basil often – best to top a pizza! I’m looking forward to making a couple of mojito’s with the mint. Thanks M for this radical birthday pressie! This entry was posted in Eat and tagged herbs, presents. I love this! What a great pressie. But the Chilli should have been fine in the sun. Sheesh, I don’t know what I did then, but that chilli plant died 1x serious death … I still have the tin though so I can plant something else in there! You should plant some coriander. Or parsley. Bring your empty one day … pretty sure I know someone with green fingers who can help you with potting. Good thinking Batman – that is a great idea. Me thinks coriander would be a goodie.